By the time one reaches the confluence of the Columbia and Kicking Horse rivers, you are leaving residential and commercial developments and able to enjoy unspoiled site-lines of rivers, forests and mountains. While it is only a short, five-minute bike ride from Spirit Square, there is much that could be done to improve this area inside the Town limits. A longtime supporter of local youth and family activity programs, Bob Finnie of the Rotary Club of Golden is spearheading a project that would improve the Confluence Park area and the trails around it. The park is has been left very natural and its functionality for humans is impacted by the naturally rise and fall of the Columbia and Kicking Horse Rivers. 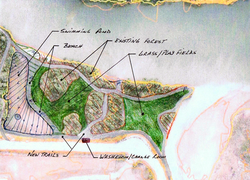 This project includes a large swimming hole that would fill as the Columbia rises. The entire project budget is estimated at just under $70,000. 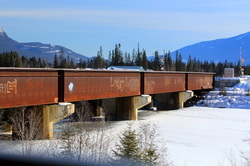 The Rotary Trails also provide an opportunity to build a Trans Canada Trail spur line into Golden, after the main trail is completed in 2017. 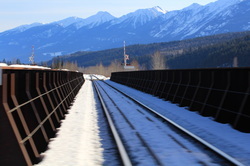 This spur line could come up the Columbia Valley or from Banff National Park to the east. Currently, the only way to legally cross the rail tracks behind 5th Ave is by following the road north. Walkers, runners and cyclists have to do a simple 'out and back' should they want to go toward the old lumber mill, airport or Confluence Park. A raised (or underground) rail crossing near the CPR works yard would allow for a 'circle route' around the Golden Municipal Airport, back to the residential areas of Golden. Conceived by local lodge owner, Irv Graham, a wire bridge across the Columbia would be a new tourism product and improve access to the West Bench, which is currently only possible by a single-lane bridge north of Golden and a 2 lane bridge in Nicholson. While the photo featured is not in Canada, one only has to look as far as the Galena Trail, near New Denver to find a local installation. 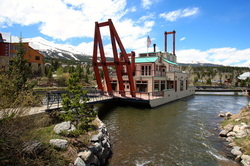 The Galena Trail cable ferry carries both people and bikes over a small but powerful stream. Both examples are proof that there is a low cost alternative to 'bridge' river crossings. "WireBridges solve this problem by spanning river gorges with a human powered carriage system. These wheeled carriages travel on cable strung between anchor towers installed on each side of the river. 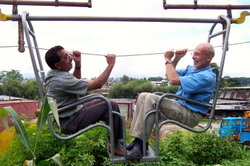 The carriage is easily propelled by rope in the hands of passengers or bystanders and each carriage can hold up to four seated passengers. This privately held land (at one time by Four Pillars Development) was at one time a beautiful forest, where walking trails meandered along its perimeter. Then, almost overnight, the 20 acres were clear cut in preparation for ~250 new housing units. Then, the real estate boom of the 2000s went bust and now the bank owned land sits vacant, unproductive and an eyesore to anyone that remembers the forests that once stood. Without purchasing this land through a local government land reserve fund at market value (listed at $1.8M), there is little that residents can do with it now. It will have to wait until the housing industry recovers and another developer can make a business case. In the meantime, it is important to remember it as a plan gone astray. Local realtor, Flec Demmon has suggested that the Town of Golden should swap Keith King Memorial Park with the Four Pillars Development Land. Any development at the Four Pillars property would require ~$10M in water and sewer infrastructure improvements, which means that $30K/property in infrastructure costs would be passed on to the developer and any potential purchasers, making it cost prohibitive. This potential land trade would create residential property in a desirable part of town, near schools, and services and well above the Columbia River and Kicking Horse River flood plain. At the same time, relocating the park into a central, visible location would make it more accessible to under-served residents in the north half of Golden, while reducing the "traffic jams" complained about by Selkirk Hill residents. The Town of Golden owns and operates the Golden Municipal Airport (CYGE), which is located in the Town limits, between the CPR tracks and Columbia River. The runway is 2,575ft/785m above sea level and has a runway of 4,500ft/1,371m. 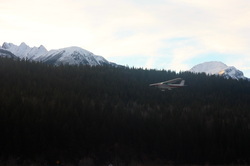 Currently, there are a number of private operators based out of the hangars and other buildings there, including Yeti Extreme Skydiving and Golden District Search & Rescue. While activity has increased at the airport, up 70% between 2009 and 2010, it is still limited in the type of activity it can handle. There are some substantial upgrades planned for it, however there are no resources dedicated to it at this point. A display could be created somewhere along the Golden riverfront, which could be inspired by riverboat restoration, museum and displays found in Penticton, BC (museum in the paddle wheeler), Simcoe, ON (restored Alligator Tug) or Breckenridge, CO (dredge replica with restaurant). Up until 2011, there were 2 small log tugs that were left derelict in Bush Harbour. They have since been scrapped. Sitting on the east banks of the Columbia River lies the Old Lumber Mill. 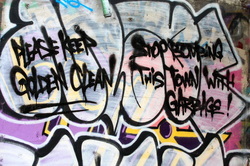 What remains of the concrete and overgrown structure is covered with graffiti. Youth often have parties out there and the site is now home to a large, garish galvanized metal electrical tower. Potential uses for the site include a picnic pavilion or outdoor art gallery. 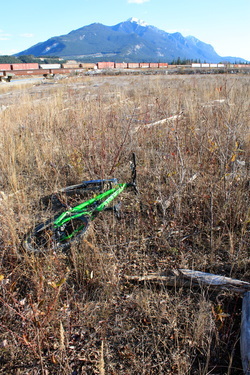 This site could be developed with improved access via rail crossings and riverfront pathways. In the meantime, the formerly-grand-but-now-derelict structure is an eyesore (as no one is really sure what it is) and a liability. The Rotary Trails are used by countless residents and visitors every day. While some people like to let their dogs run free on it, the Town of Golden has a leash law because many people in public spaces like the Rotary Trails do not appreciate having someone's dog running at them. In order to encourage both dogs and owners to socialize while maintaining the comfort and safety of the rest of the public, a dedicated dog park could be a wonderful addition to Golden's riverfront. There are underutilized fields that could be designated as parks and have the appropriate fencing and services installed. This would reduce the messes left on the Rotary Trails, reduce the number of human-dog conflicts and improve the quality of life for all of those that use the trail system. The following document is an Off Leash Recreation Area Program Plan Review from the City of Saskatoon, which may help Golden plan one of our own.